This story was amazing. It starts off slow, but that is a bit of misdirection. The plot quickly lurches into a break-neck pace, with new surprises every few minutes. 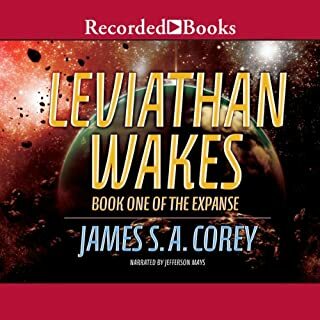 As most of you know, this is the story on which the SyFy channel has based their new series, "The Expanse". 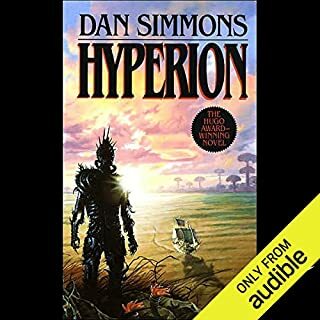 Having seen the first three episodes of the TV series, I can tell you that it is no substitute for listening to the Audible book. I was suprised at the lack of quality of the narration. Jefferson Mays simply reads the book to you. This is a little different than what I am used to for Audible books. There is usually acting, with the narrator taking on specific voices and accents for each character in the novel. The latest Star Wars, The Force Awakens, audiobook even has sound effects. The quality of the story deserves quality voice acting. However, the Kindle book or the audiobook is quite worthy of anyone's attention that enjoys a sci-fi mystery, and a credible future where man has extended his reach throughout the solar system. I thoroughly enjoyed this book featuring Cody Riggs. There were new characters, a fresh story, and an exceptionally exciting romp through an unexplored part of space, containing unusual, but deadly enemies. I like that Cody Riggs acts a lot like his father, though he is more thoughtful, and more considerate of a woman's feelings than Kyle. I've seen some complaints about the similarities, but I would be disappointed if the son was not like the father. This one was hard to put down, and exciting through the last minute. I like how the story ended with hints of learning about "the Ancients". As a Stargate and Babylon 5 lover, the Ancients sound very tantalizing. Kyle Riggs has been away from Earth for a long time.... What’s happening back home? 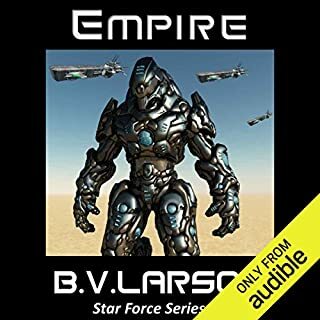 In Empire, the sixth book of the Star Force Series, the story moves in a new direction. Earth falls quiet, and the few reports coming out of the homeworld are increasingly strange. Isolated in the Eden system, Riggs realizes his enemies are forming an alliance against him. Crushed between two monstrous fleets, the last defenders of Star Force must forge their own alliance with the biotic aliens. But which alien race can Riggs truly trust? 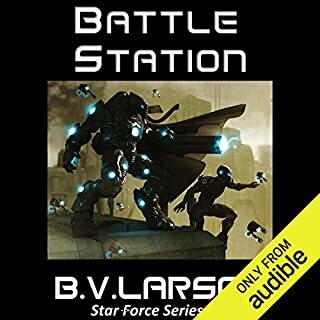 If you are looking for sci-fi that is fast-paced, fun, and incredibly interesting, I'd recommend the Star Force series for you. 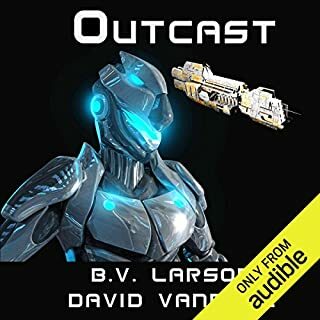 The author has carefully crafted a military sci-fi universe where new discoveries and surprises await, leaving the reader astonished at the depth of B.V. Larson's imagination. Most sci-fi series that I have read have at least one book where things do not click, or the plot seems forced, or difficult to believe. In contrast, every book of this series is strong, and I keep thinking that the best one is the book I just finished. Mark Boyett, the narrator, is quite amazing as he seamlessly switches his accent from one member of an international team to another to yet another. It adds an extra dimension of enjoyment over the text version of the books. My first venture into the world of military Sci-Fi was John Ringo, and I was so disappointed with his books, that I was reluctant to try a different series in the same genre. When I saw that the narrator, Mark Boyett, was the same as the Ringo books that I had disliked, I had further reservations, even though Boyett is a great narrator. My fears were totally unfounded. 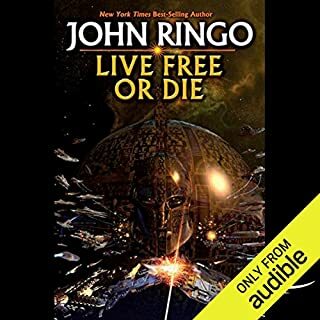 This is a light, action-packed sci-fi adventure where the fast-paced story is never held back by overly-detailed technology explanations or self-righteous, right-wing sermonizing as in the Ringo books. The sci-fi tech is very interesting and well-thought out. I found it was also pleasing that the tech did not seem to be the point of the story, but rather was secondary to the well-conceived plot. The protagonist questions himself, and yet is capable and competent, with a good since of humor. He is very likeable and it is enjoyable to be privy to his decision-making process throughout the numerous battles with the Macros and other species. I usually just listen to my audiobooks in my hour commute back and forth from work. The Star Force series has been so intriguing and gripping that I had to bring it into the house and listen to it there as well. I've finished three of the books so far, and each time I finish one, I don't wait until I have the credits to buy the next installment. 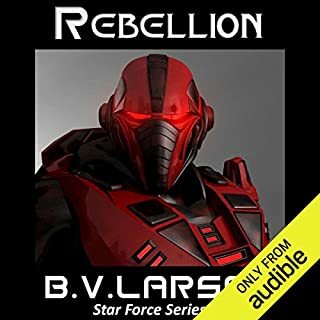 I've not had this much fun with Sci-Fi in a long time, and I will probably be exploring more of B.V. Larson's books in the future. I couldn't believe how much I liked this book when I launched into the first few chapters. I also couldn't believe how much I disliked this book when hour after hour was spent discussing the pros and cons of various engineering problems. Instead of the rapid-pace events of the book's beginning, be prepared for bureaucrats, negotiations, engineering brain-storming sessions and one meeting that leads to another that leads to still another, seemingly endlessly. I appreciate that John Ringo has given this a great deal of thought and wants to include the detail he has imagined for this project. However, I just really don't care how you are going to solve the problem of cutting a door through a nickel-iron chunk of asteroid. This is not really hard sci-fi, which I love, but hard engineering fiction where a person is supposed to enjoy the debates about advanced engineering topics. Included in these long discussions are questions about how much tonnage some device should be, and the pros and cons of having an interior 9 kilometers across versus 10 kilometers because they didn't use enough volatiles when expanding the sphere. I'm not surprised to find that Dan Simmons also writes horror stories. This well-crafted tale is punctuated by grisly and gruesome scenes that make you gasp in horror. I sometimes found the descriptions so disturbing that I would have to stop listening, and come back to it, when I had gotten over the impact. Simmons has few equals, if any, in story-telling. Instead of having haunting images presented to me as I read, I would have preferred a PG-13 version. Note: I hate horror movies, murder mysteries, slasher movies, and anything involving macabre depictions of torture and death. So, this is written not as a warning for the general listener, but for anyone who might think twice about listening to or reading a horror tale. The narration in this story is excellent. Cody Westcott, a young archeologist, returned from a dig at Apachetarimac with more than he bargained for. Seems the Chachapoyans that he had been studying had a lot to teach us all. Soon he steps through the looking glass but unlike Alice its no fairytale world that he finds. Instead it is our own world teeming with Interlopers-Those Who Abide. Unseen by the mass of humanity they are aware that Cody can now see them. They dont like it. 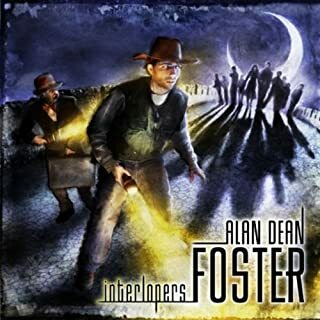 I am an Alan Dean Foster fan, and now a Ben Browder fan. I've enjoyed Browder on Farscape and Stargage SG-1, but his reading of this very entertaining novel made me appreciate how vast his acting talents are.